Imagine a region of dunes surrounded by a sea of volcanic sand and mountains sprouting seemingly from nowhere, with active hills and smoking volcanoes. You don’t need to image it as this place already exists in Indonesia at the Bromo Tengger Semeru National Park. This Park covers an area of 800 km2 and within it are 5 impressive volcanic mountains, among them Mount Semeru, the highest point of Java, and the star of the Park: Mount Bromo. 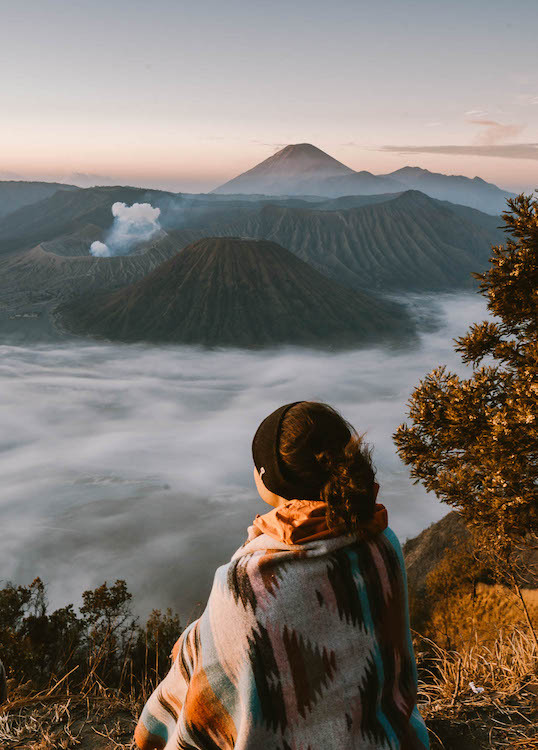 Mount Bromo is an active volcano that draws thousands of people to the top to see its caldera and confront the power of nature closely, as well as enjoy the panoramic view of the place. At 2,329 meters above sea level, with a crater that is about 800 meters in diameter and 200 meters deep, MountBromo (named after Brahma - Hindu god of creation) is in an area known as the Sea of Sand (Segara Wedi in Javanese), which is a natural reserve contained of volcanic sand dunes; protected since 1919. The entire area of the Park is considered sacred by the Hindu group Tengger, who resides in the region; so, there you will find the Pura Luhur Poten temple - a structure in the middle of the Sand Sea - and see people offering flowers, food and other items to the volcano at the top. 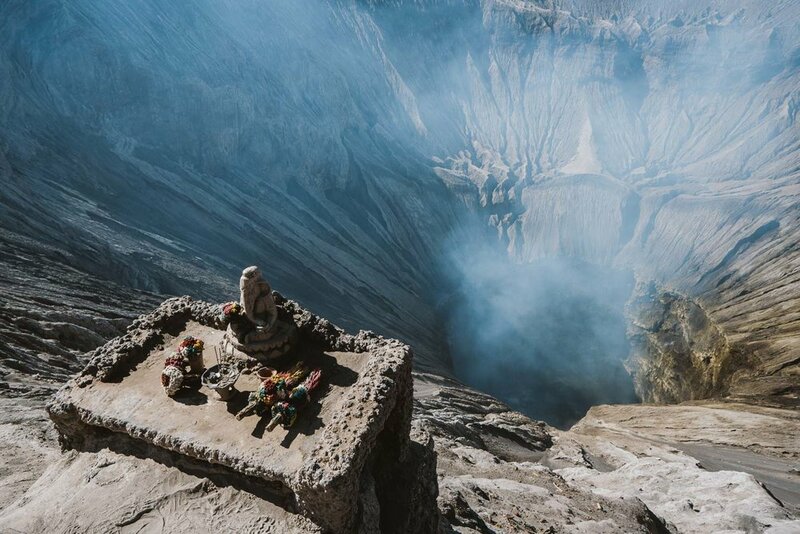 The Bromo Tengger Semeru National Park is located in the eastern part of Java, Indonesia, three hours away from the city of Malang and about four hours from Surabaya, the country's second largest city. You can visit the Park either of the two cities (as well as from Cemoro Lawang, that can be easily reached from Surabaya). I did the tour from Malang, which I will write about here. The tour from Malang starts with a departure of 1 am from your hotel, followed by a two hour drive to a small village where you will transfer to a jeep from the remainder of the journey.. In the parking lot you will see many jeeps waiting to continue the expedition (starting at 3 am sharp). Once in the jeep, you travel a further 30 kilometers to the beginning of the short walk taking you to the viewpoint on Mount Penanjakan, a mountain at 2,700 meters high, where you will see the sunrise and take in the view of Mount Bromo and the other peaks, such as the Semeru (the largest) stretching gloriously behind, and the Batak (which is in front) forming the perfect setting. The viewpoint itself is usually full of people, so ask your guide to take you along a trail to climb a little further up the hill for a better view. While it is still dark, you will be able to observe the stars and, on a good night, even the Milky Way. The shooting stars, which eventually appear, crown the moment and may even validate what the Tenggerese believe: you are in a sacred place. As the first rays of sunlight begin to appear, you will be able to see the haze that covers the entire park and create a dreamy atmosphere, giving a special touch to this region of volcanic soil. After the sunrise, it's time to head back to the jeep (around 6 am) to see the star of the park – Mount Bromo. 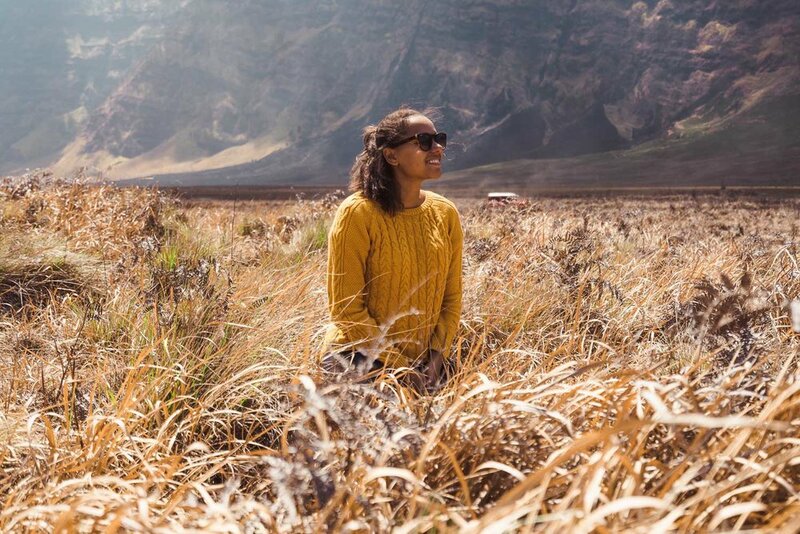 Even though Semeru is the highest peak, it's Bromo that everyone talks about and where they all want to go; and from afar you can already see it is active and steaming. 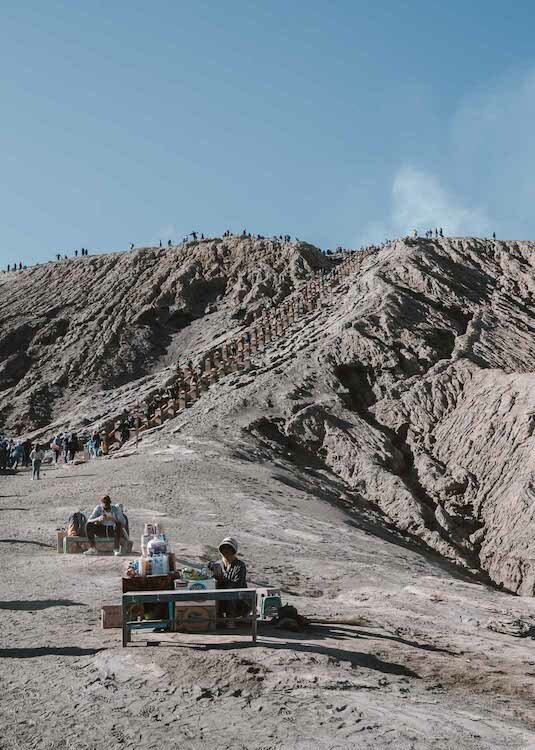 After a few minutes you will arrive in the jeep parking area inside the crater-like park, where you will have the option to walk or use the horses, that some people rent, (not included in the tour) to make your way to the stairs leading you up to the Bromo crater. The horse costs 50,000 IDR per person, but I do not recommend using them - the walk is easy and can be done calmly. Along the way, the winds and people kick up the sea of sand and the dust rises, so it is recommended to wear sunglasses to protect your eyes and something to cover the nose, such as scarves or hospital masks. 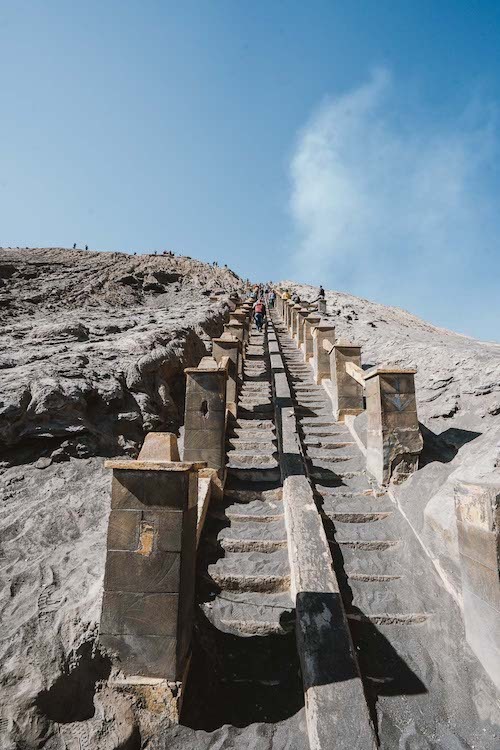 Once you reach the foot of the volcano, you need to to climb another 200 steps to reach the crater and when you get up there you will be confronted with a potent sulfur smell. The view from above is beyond exceptional and breathtaking (almost literally, after climbing the steps), and here it is possible to recognize the human fragility in contrast to such a majestic nature. It is hard to find words for what you see up there, as it is not enough just to be on top of an active volcano and look at your crater; if you can look away fromit to look around-to the Sea of Sand, the temple, and the immense mountains all around – you will be enchanted by an immense beauty that does not seem to be real. 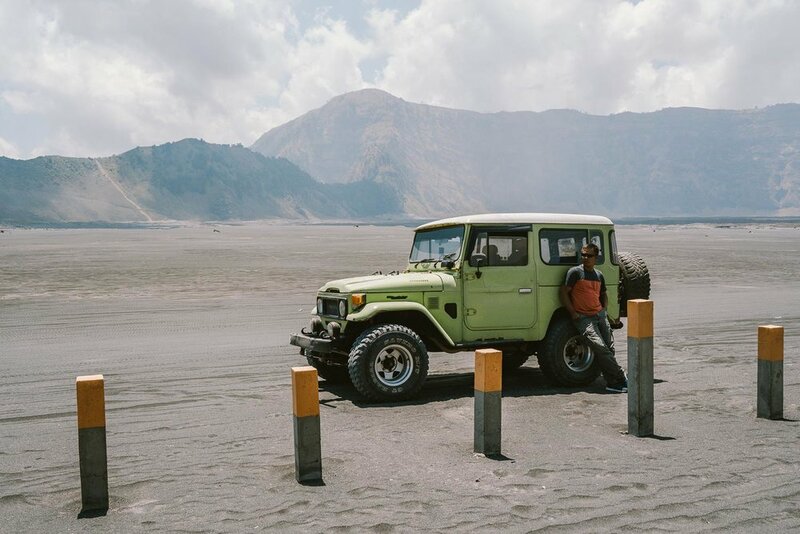 Once you have taken in the view of Mount Bromo and its crater, it's time to continue the tour with the jeep, passing by mountains that seemingly change color at every turn and make for a stunning and fascinating setting, eventually stopping at Savannah and Teletubbies Hill, a completely different landscape from the one seen previously. Here golden shrubs and green hills (similar to those of the Teletubbies TV show, hence the name) can be found, with the blue sky as the background. To finish the tour, you take the jeep to Whispering Sands, a part in the middle of the sea of sand to experience an almost absolute silence, which is only interrupted by the jeeps and motorbikes that occasionally pass by. Alone in the midst of the vastness of a colossal panorama, there is again the belief that you are in a sacred place. All the triumphant images we see in magazines, books and websites are true, it is only the impact that is much higher in real life. If you are in Java, or visiting other parts of Indonesia, do not miss the opportunity to go to Mount Bromo. During the night and at the beginning of the tour, be prepared for low temperatures and freezing cold; during the day the weather becomes milder and you may want to remove all the layers you used in the beginning. We stayed at Tugu Hotel in Malang which was a comfortable and enjoyable stay, and we booked the tour direct with them. If you would like another option, please contact Riski. The price of the tour package to visit Mount Bromo from Malang starts at 1,000,000 IDR/pax, depending on the group size. Hey, do you use Pinterest? So, don’t forget to save the image below to find the post later!